A 30-win season is celebrated by most prep boys basketball programs. At Findlay Prep, it gets picked apart and scrutinized. Canyon Springs' Brandon Edmond (2) runs out the clock in the fourth quarter on Thursday. 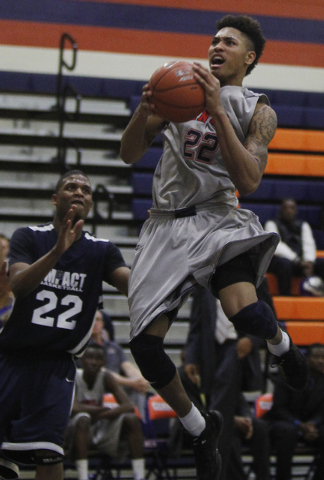 The Pioneers beat Desert Pines, 66-61. 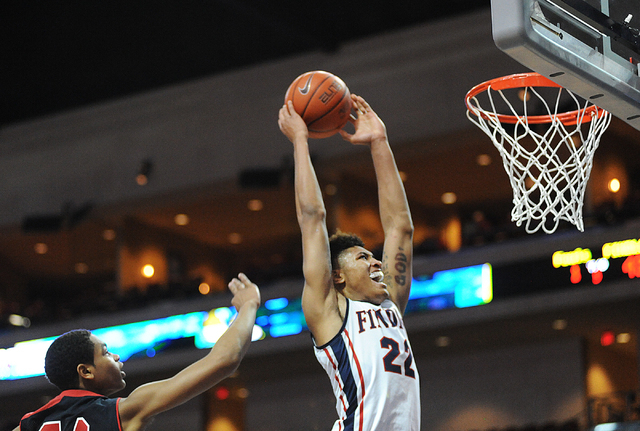 Findlay Prep basketball player Kelly Oubre goes in for a dunk against the Prime Prep on Friday. Jerome Williams knows that just comes with the territory. Findlay Prep recorded its third consecutive 30-win season and has two players — senior guards Kelly Oubre and Rashad Vaughn — in tonight’s McDonald’s All-American Game. But the Pilots (30-4) also fell short of preseason expectations and, in the process, tied the 2010-11 team for the most losses in program history. The Pilots will look to finish what’s been a disappointing season by their lofty standards on a high note when they participate in the High School National Tournament this week in New York City. Findlay Prep, the No. 7 seed, meets second-seeded Rainier Beach (Wash.) in the quarterfinals at 1 p.m. Thursday on ESPNU (320). Findlay Prep opened as the No. 1 team in USA Today’s preseason Super 25 rankings but hit several bumps. The Pilots had a 92-game home winning streak snapped in a 73-71 loss to Future College Prep (Calif.) on Dec. 11 and dropped high-profile showdowns against Prime Prep (Texas), Montrose Christian (Md.) and Bishop Gorman. Along the way, Jonah Bolden transferred to Brewster Academy (N.H.) when his high school eligibility expired following the first semester, and Vaughn was hampered by a knee injury that forced him to miss nine games. Horace Spencer (thumb), Derryck Thornton (cyst in arm) and O’Shae Brissett (broken kneecap) also suffered season-ending injuries. Findlay Prep enters the High School National Tournament with only seven healthy players, led by Oubre (team-high 22.2 points per game) and Vaughn (20.6 points, 4.5 rebounds, 5.0 assists, 2.2 steals). The 6-foot-7-inch Oubre, a Kansas signee, displayed his explosiveness during Monday’s slam dunk competition for the McDonald’s game, while Vaughn has impressed observers in practice this week. The duo will play for the West team in tonight’s game at the United Center in Chicago before flying to New York on Thursday morning in time for the Pilots’ game against Rainier Beach. Findlay Prep hasn’t played since a 55-51 win over Bill Crothers (Canada) on March 2 in Toronto and used the time off to develop an extensive scouting report on Rainier Beach, which walloped Bishop Gorman 95-67 on Dec. 30. The Vikings (29-0) are ranked No. 3 by USA Today and feature Louisville signee Shaqquan Aaron. The stacked tournament field also includes USA Today’s No. 1 team, Montverde Academy (Fla.), along with No. 4 Northside Christian Academy (N.C.), No. 5 Huntington-St. Joseph Prep (W.Va.), No. 6 La Lumiere (Ind. ), No. 7 Oak Hill Academy (Va.) and No. 17 Sagemont School (Fla.). 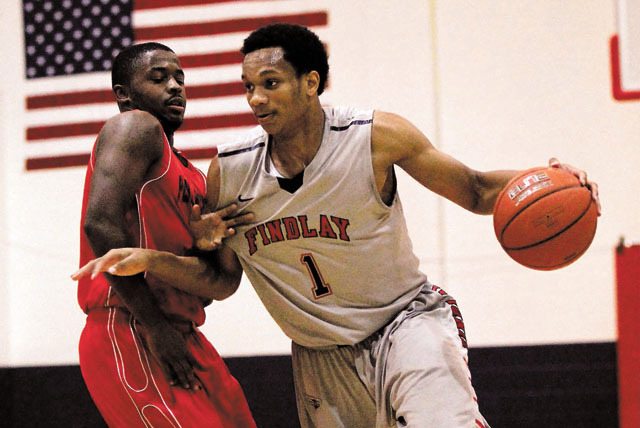 Findlay Prep, ranked eighth by USA Today, is a three-time winner of the tournament formerly known as the National High School Invitational.